Style Furniture Fort Collins - Futons, Futon Mattresses, Platform Beds, Beanbags, Füf Chairs and more! Füf chairs aren't your old beanbag! Filled with uncrushable furniture foam, Füf chairs can be re-puffed over and over - they feel like new every time! Our Beanbags are a cut above, as well. Our cloth-backed, double-zipped, triple-stitched (whew!) 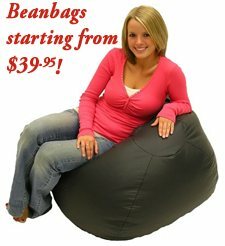 Beanbags start at only $39, and come in tons of colors and sizes! We carry refills for them, too. Beanbags - too many colors and styles to show - come in today! Füf Chairs - All of our Füf chairs include a removable, washable cover! Available in many colors. including our custom order options, there are over 200 colors and styles of cover to choose from! We carry too many styles to display! Come in to see our complete collection, or let us custom order the perfect Füf Chair or Beanbag for you!